The area’s No. 1 source for high school football fans on Fridays, TriStateFootball.com, returns to the radio for the 2018 season! Tune as we bring the thrill of game night to the airwaves every Friday night this season. High School Football Tonight is on not one, but two different radio stations. The only two radio stations in the market dedicated to 24/7 sports coverage, ESPN 1530 and FOXSports 1360, each are broadcasting high school football once again this fall. In addition, all broadcasts will be carried on mobile devices an online via I-Heart Radio. Co-hosts Dan Clasgens, Greg Shoemaker and James Rapien will serve as fans tour guide around the area’s top games as they welcome in members of the TSF staff throughout the evening and talk to players and coaches directly from the field. The St. Xavier Bombers will also once again be broadcasting their games in 2018 on WSAI-AM (1360), as well as on WCKY-AM (1530) most weeks. 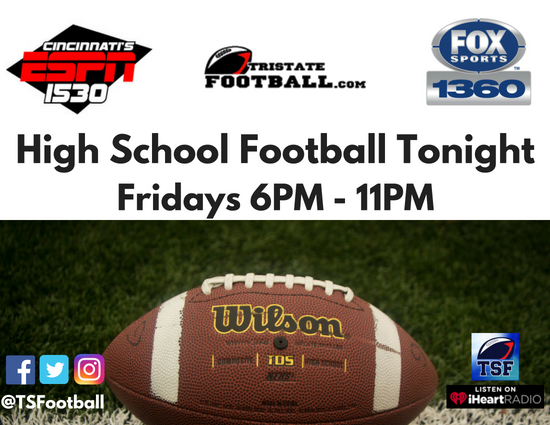 High School Football Tonight will have a pregame show (6:00 PM – 15 minutes before kickoff) and a postgame show immediately following the game (approx. (9:30 PM) to 11:00 PM each week. *Show schedule TBD for November – stay tuned!